I hope your day has been a pleasant one so far. Another lovely day here. It's 76 degrees with a slight breeze. I have my windows open to let some of that fresh air into my house, and it is sooooo nice! This guy has one of those faces that only his mother could love! 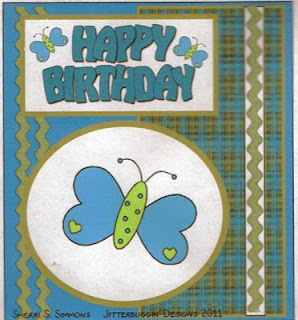 * Paper-I love this paper, it's from DCWV Songbird Stack. *Frog - Boys Will Be Boys Cricut cartridge cut at 2 3/4 inches. * I used the Swiss Dots folder on the frog and the Spots and Dots Cuttlebug folder on the background mat. Since we are celebrating the birthdays of our presidents this week, let's make some birthday cards. This week, you need to follow the sketch, make it a birthday card, and add some rickrack somewhere. Don't forget you can cut rickrack with your Cricut too........ Use that Cricut for something....be creative....and have fun! This was a fun challenge to work with...love sketch that was provided. Now, I need to get busy on my project for my upcoming Fantabulous Friday segment...hope you will join me at FCCB this Friday! Thanks for dropping in and I'll see you soon. This little guy is just too cute! I love the embossing you chose and the clever way you used rickrack. Those Swiss Dots are perfect on the frog! Great card! So cute! Good luck on the challenge!